So far, Google's Music service is only available in the US. Search giant Google has entered the online music market with a new service for finding and buying music online. OneBox is an alliance with music sites Lala and MySpace-owned iLike. The US-only service allows people to search using song titles, artists or using snippets of lyrics and will also stream sought-after tracks. Mark Mulligan, an analyst at research firm Forrester, said the service may offer a compelling alternative to illegal file-sharing. "Apple can do little about iPod owners downloading from BitTorrent," he said in a blog post. "But Google on the other hand can." BitTorrent software is widely used to trade music and movies. 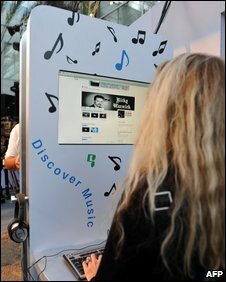 A MySpace box allows people to buy MP3s of the tracks and also highlights music videos and other information, such as upcoming concerts by the artists. Apple currently dominates the online music market with around 70% of worldwide sales. In Europe, firms such as Spotify are also beginning to gain popularity. The free music-streaming service ,which launched in 2008, now has more than two million users in the UK, and more than six million across Europe. The new Google collaboration will hope to emulate the success of these services. The firm already offer free downloads of licensed music tracks in China and has said it was now trying to find partners in other countries to take the new music model international.